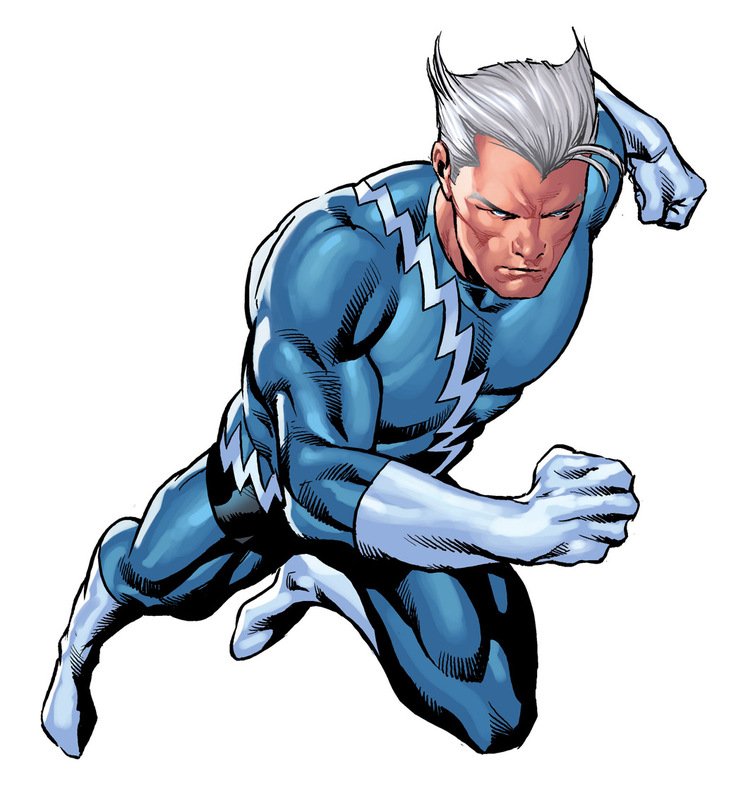 Pietro Maximoff first appeared in X-Men 4 back in 1964, since then he’s been a mutant, not a mutant, good guy, not a good guy, terrorist, leader, father, husband and a dozen other epithets, but most consistently he’s been one thing, a massive d**k.
Originally a member of Magneto’s Brotherhood of Evil Mutants, Quicksilver was the speedster joined along with his sister Wanda, the Scarlet Witch and it was soon apparent that Quicksilver was just there to protect his sister from being exploited by Magneto, harassed by Toad and who knows what worse fate by Mastermind. Pietro had no love for humans, but lacked the hate his fellows had. When the Brotherhood broke up and Wanda went straight, so did Pietro and the pair joined the second iteration of the Avengers in Avengers 16. 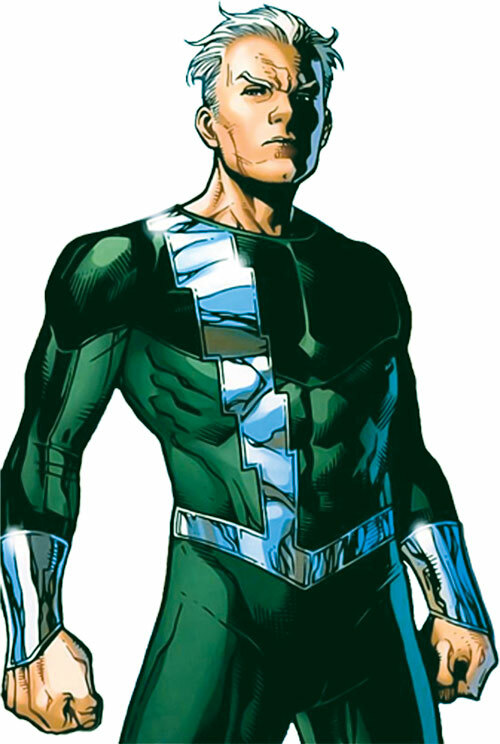 On and off with the Avengers, then a failed marriage to Crystal of the Inhuman Royal family, he then found his way to the second iteration of X-Factor. This was where I got to know the character best. Most comic related speedsters, start off as human, or are very attached to their human side, but Pietro is very at home with his speed and was built for it. In the classic X-Factor 87, Peter David wrote down the way that Pietro sees the world, a world too slow for him. The entire world is full of people who aren’t capable of living life in his speed. He likened the whole population of the Earth to people who couldn’t operate cash machines. Once I read that, he made sense as a character and I began to view him far more sympathetically. Even his relationship to Magneto (retconned to be his and Wanda’s father, then later retconned to not be) made sense in relation to his abrasive manner. Imagine being trapped in a world too slow and stupid for you and your father was the Hitler of mutants, how would you act? But boil that all down and he’s the character in your ensemble that is just an @$$. 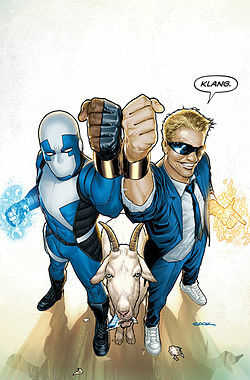 He’s Guy Gardner from the JLI, Spike from Buffy the Vampire Slayer, Jayne Cobb from Firefly, Fancy from Killjoys or Jack Hodgins from the early seasons of Bones. They say and do what the ‘heroes’ won’t and offer the alternative view. He’ll never be the hero, constantly overlooked for his more powerful sister and once his monstrous father, he still is a character that is more relatable and more understandable and who is at times very entertaining. 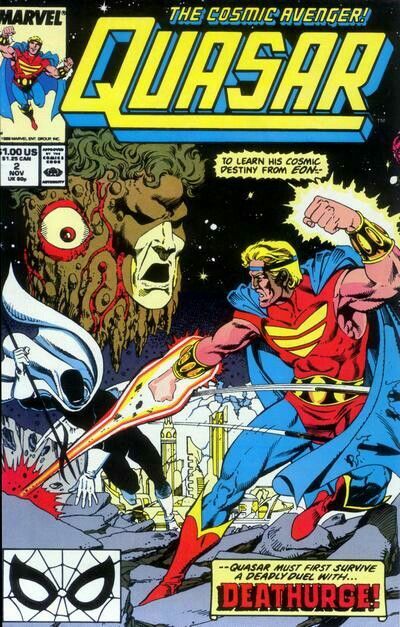 Issue 1 of Quasar was released on June 1989, with an October cover date, was written by Mark Gruenwald and drawn by Paul Ryan. It was the story of Wendell Vaugh, a mid-level S.H.I.E.L.D. 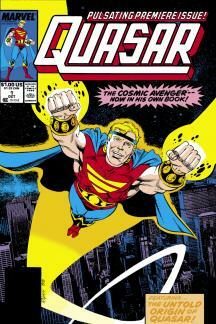 agent who found his way to possess the Quantum Bands and sort of inadvertently became the protector of the universe. Vaughn had shown up in Captain America and Marvel Two in One, but in his own title he went from strength to strength. Rather than the rather cipher like character as a guest star, in his own title he was a big of hero-geek, in over his head and full of the second-guessing and hero worship that you would expect if someone who was never really meant to be a hero became one. Working with the cosmic entity Eon and trying to run his own small security business, the reader watched him slowly grow into being the hero he needed to be. Gruenwald knows how to write this kind of story and the clean art style of Paul Ryan started this series off in classic marvel house style and this is a series that is well worth reading for it’s examination of what it means to be a hero on the cosmic scale. 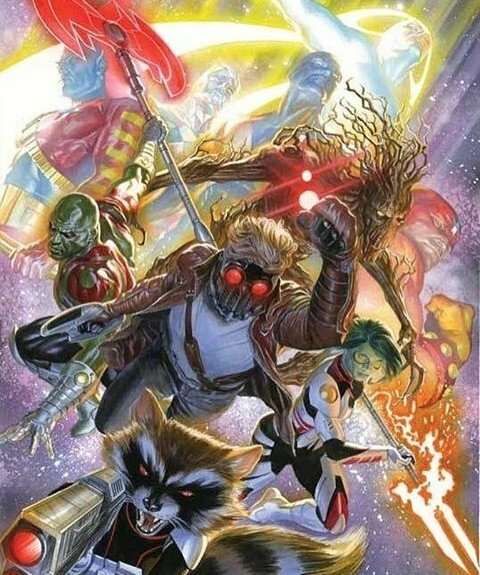 Super hero comics are from their origin an American invention, America, from it’s origin is a republic and has little time for real monarchies, unlike many nations of Europe which have monarchial holdovers even in their democratic present. But if you look through comics, there’s a $**tload of royalty there. DC have Wonder Woman, who is a the daughter of a queen as well as Aquaman, who is king of Atlantis, as well as all the oceans to go with it. 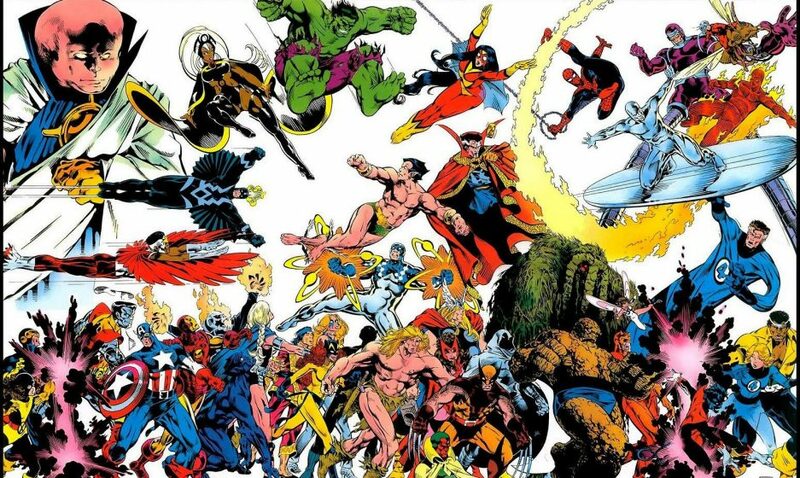 Across the divide at Marvel, we have Namor, who is monarch of their Atlantis, several of the alien races in Marvel, Skulls, Xandarians, Shi’Ar and Spartoi are all ruled by monarchs and many of them have been seen as heroic. Thor is a prince of Asgard even. Then we have the Inhumans, supposedly the more advanced sub-species of humanity, but they have a Royal Family that rules with unshakeable authority and a slave-class in the Alpha Primitives. These by the way are the good guys there. The only legit royal bad guy is the despotic Doctor Doom. This use of fictional royalty is interesting to a citizen of a nation still paying for a predominantly figurehead monarchy. Maybe it’s a simple as that desire to see idealised versions of real things. We all want to see doctors like Don Blake, soldiers like Steve Rogers and reporters like Clark Kent, maybe we’d also like to see Kings like Black Bolt, Queens like Medusa, princesses like Wonder Woman and princes like Namor. If we did, maybe we’d view them more favourably? Or maybe it’s even simpler, they’re part of the fairy tale tradition, making Aquaman a modern prince charming and Thor a modern day disney princess.